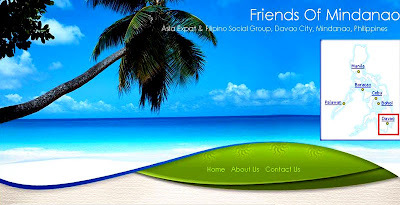 Friends of Mindanao is a group of foreigners and their wives/partners, based in Davao City. We meet socially in each other’s homes and in local restaurants. We also organize group trips to explore other parts of Mindanao. On the first and third Wednesday of each month we meet as a larger group to exchange news and information about living in Mindanao. We also from time to time support local worthy causes. All members have an equal standing, there are no officers and no membership fees – it is purely a network of friends who meet socially. We have just launched a new website at www.friendsofmindanao.com and would welcome people who would like to give presentations to our meetings held in Davao City. Past speakers have included attorneys, officials from the Bureau of Immigration, senior personnel from Davao City Jail, talks from experts in hydroponics, vehicle licensing experts - and so on. We do not encourage speakers who merely want to sell goods or services to our members.